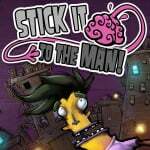 After a degree of speculation, it was confirmed last week that Stick It To The Man is coming to the Wii U eShop, targeting a Spring release. Currently available on PC, PS3 and PS Vita, it's a distinctive title from Zoink!, with UK publisher Ripstone stepping in to bring the title to market; as a hybrid adventure platformer with hints of old point-and-click ideas, combined with a paper-based visual style, it's certainly full of promise. We caught up with Ripstone's co-founder Phil Gaskell and Zoink! founder Klaus Lyngeled to chat about the upcoming release just prior to its public announcement, taking the opportunity to learn more specifics about the title. In an interview to be published in full tomorrow, Lyngeled said that tweaks and lessons learned from previous iterations make this the "gold version", before explaining exactly how the GamePad mechanics will work. Lyngeled: When we talked about doing a Wii U version we knew we'd have to use the GamePad, with the screen, and we thought it'd be cool to use it as a mind reading device. The way we've done it, which I think works really well and turned out good, much better than I expected, is that when you pick up the Wii U device it goes into mind-reading mode, so it feels when you pick it up or rest it down. So you can basically point around on the screen itself, pick characters, zoom in on their brains and pick which brain you want to read. So there's a specific mind-reading screen on the GamePad and the main screen on the TV. This way it's much quicker to go from one brain to another if there are a lot of people around the same area. Then of course you have the mind-reading voice itself coming out of the GamePad, also, which I'm really happy with. So is the GamePad screen permanently in a more zoomed in view? Lyngeled: Yeah, it shows this weird mind-world background. Then every character that can be read appears on this little screen, you can target zoom on each of them at which point it also zooms in on the TV itself. Then of course you also have a map, so when you're not mind-reading there's always a map appearing on it, but that's simple stuff. In terms of how that affects the experience, is it mainly streamlining or making sure you don't miss any mind-reading opportunities? Lyngeled: Yeah, it makes it more streamlined and easier to pick brains. We always had that problem on PS3, if there were a lot of characters in the same place it was a little hard to pick the right one; we had some bad reviews about that. It was obviously easier on the PC when you had the mouse, just click on the brains, but here it's kind of the same in that you just point at which brain you want, it's actually easier that way. It just feels funnier, it fits together. Gaskell: For me it separates the mind-reading element from the 'real world', or Ray's world, there's a really clear delineation between them. It feels good, it feels like you're more Ray, because the mind-reading noise is more local to you coming out of the GamePad speakers rather than the TV, so it's more intimate. Lyngeled: And then you have this cool device that's just nice. Is there off-TV play, and if so does the gameplay revert to the PS3 style? Lyngeled: Yeah, off-TV is there. If you play on just the GamePad, you can use the pointer like on PS3 but you can also touch the screen itself for picking the brains. For those that aren't necessarily the GamePad's biggest fans, are there other controllers supported? Lyngeled: It supports the Wii U Pro Controller. Gaskell: It doesn't support Wii Remotes. In the full interview we'll discuss Zoink's previous work and go into greater details around Stick It To The Man's origins and route to Wii U, as well as gauging views on the Wii U eShop and the upcoming year for the system. Until then, are you intrigued by this game and looking forward to its GamePad features? Below is the launch trailer from last year to show you what it's all about. Like i said on the Rayman news, if done right, the WiiU version is mostly the "gold version"
The freedom in controll options alone makes it special, ranging from a touch interface, to a pointer all the way to the use of a classic controller. There is basicly no hurdle when it comes to designing HOW your game is supposed to be played. Seems like they are putting a lot of effort into this port, I like the option of different controls. Not typically my type of game but I may support it if the end product turns out well. (Stick it to the) Man, I can't wait for this. I've been holding off from grabbing the Vita version since hearing whispers of Stick it to the Man heading to Wii U a few weeks back — don't get me wrong, I like my Vita, but I LOVE my Wii U..!! I've never heard of this, but it looks really good. Definitely has an old school point-and-click adventure feel to it. It kind of reminds me of Psychonauts. Also, I really like the way it sounds like the GamePad will be utilized. I agree with you as well, @Einherjar. I really wish more people (both gamers and developers) would get this through their heads. @FiveDigitLP The "trick" with the gamepad is simple: Use it, dont force it. EIther you have a brilliant idea to implement is fully, or use it as an alternative control method or leave it be completely. Anything other than that wont result in anything worthwhile. @Einherjar That's how I feel, too. I think because of the Gamepad, almost any game has the potential to be the definitive version on the Wii U. Whether or not the developers take the time to make it special or not, is up to them. @Spuratis You can even improve games that arent catered towards the gamepad with it. Look at all teh open world titles. Having a constant map and / or inventory on your gamepad cuts down time spend in opening and closing menus. Its way more immersive and highly practical. And UnEpic showed us, that PC like shortcuts are also a good way to use the gamepad. There are so may subtle ways to implement it. The problem is, people will almost always complain about it being under / overused. This game looks like it'll be fun. I ow this on ps3 but will most get it on wii u it's such a amazing creative game i love games like this the art style and funny jokes and gameplay. I may download this weird looking game. I'm really interested in this, but everyone compares it to Psychonauts, and oh man did I ever hate Psychonauts. Looks awesome. Reminds me of the Parappa the Rapper games. Please Please let them make more point and click adventures for Wii U. Just Imagine a HD Monkey Island, it could be a remake or new, either way it would be great!